WASHINGTON — U.S. forces shot down an Iranian drone in southern Syria on Tuesday, the second such air-to-air encounter this month as opposing forces converge around a key American training garrison near the border with Jordan and Iraq. 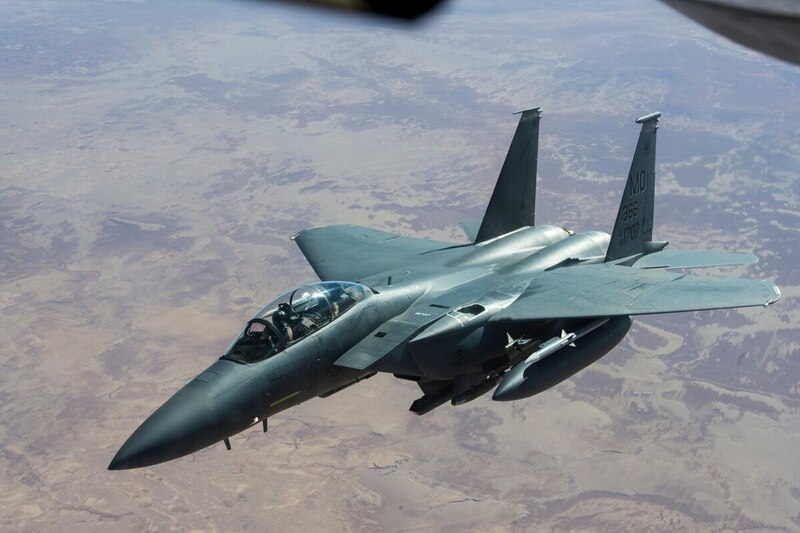 The Shaheed-129 drone was armed and displayed hostile intent when it was intercepted by an F-15E Strike Eagle around 12:30 a.m. local time near the Syrian city of Tanf, according to U.S. Central Command. It was observed heading toward coalition forces, who were outside the outpost, officials said. The incident occurred in approximately the same location where, on June 8, a U.S. jet shot down a similar drone that attacked coalition and partner forces on the ground. In that instance, the munition turned out to be a dud. No Americans or U.S. allies were wounded in either incident, officials said. Tuesday's encounter is the latest development in what's become an increasingly hostile standoff between the U.S. military and the various forces supporting Syrian President Bashar al-Assad's fight to stay in power. On Sunday, a U.S. F/A-18 Super Hornet shot down a Syrian Su-22 attack jet after it fired on U.S. allies near the city of Tabqa, which is well to the north of Tanf. That incident flared long-simmering tension between the U.S. and Russia, which backs Assad and declared over the weekend it would begin to target coalition aircraft if they stray into territory the regime seeks to control. These skirmishes illustrate how congested and complex the battle space has become in Syria. American forces and their allies are focused on fighting the Islamic State. But as the terror group loses ground in and around the city of Raqqa, which is its self-declared capital, the chase is migrating southeast, into the Euphrates River valley. And there, warring parties in Syria's ongoing civil war continue to jostle over territory. As a result, there is greater risk of conflict between the U.S. and Iran. On Monday, the Iranian Revolutionary Guard Corps demonstrated some of its military prowess by launching ballistic missile strikes from western Iran against ISIS targets in the Syrian city of Deir ez-Zour, according to The Guardian. Propaganda videos followed, highlighting an Iranian Shaheed-129 filming the strike. Some analysts believe Iran is attempting to establish a land corridor in Syria, linking its capital, Tehran, all the way to Lebanon, where its militant proxy, Hezbollah, operates. "I think Iran is trying to preemptively shape what a U.S.- Iran conflict would look like, keep us focused on eastern Syria and away from key Iranian interests in the west," said Jennifer Cafarella, an expert on the Syrian conflict at the Institute for the Study of War. Iranian interests in the west include Lebanon and the Syrian city of Quneitra, a small city nestled near the Golan Heights. Israel has controlled the Golan Heights since the 1967 Six-Day War. Attempting to de-escalate the situation, U.S. officials in Baghdad have sent out notices reminding parties involved in Syria that there is a de-confliction mechanism in place with Russian forces to reduce the chances of "strategic miscalculation." On Tuesday, Navy Capt. Jeff Davis, a Pentagon spokesman, said the U.S. did not use the deconfliction line before destroying the Iranian drone because the event unfolded very rapidly. It was a "matter of minutes" between intercept and shoot-down, he said.